2. Melt the butter in a 25cm non-stick frying pan over a medium heat. Pour the egg mixture into the pan and cook for 3-4 minutes until the eggs are just set. As the eggs are cooking, use a spatula to gently lift the cooked parts to allow the uncooked eggs to flow underneath. Remove from the heat and keep warm. 3. Spread the refried beans and salsa on the tortillas to within 1cm of the edge. Sprinkle with the cheese. Place each one on a microwavable plate. Microwave each one on High for 45-60 seconds until the tortilla and beans are hot and the cheese is starting to melt. 4. Slide the cooked egg onto a board and cut in half. Place one half in the centre of each tortilla. 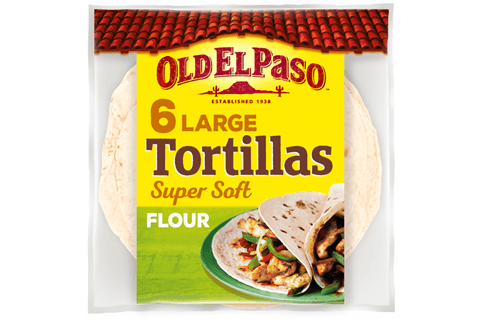 Fold the top and bottom ends of each tortilla about 2cm over the filling. Fold the right and left sides over the folded ends, overlapping. 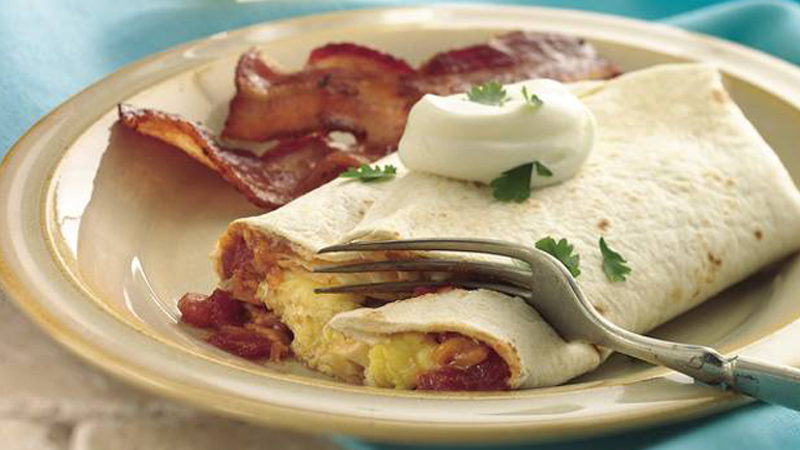 Cut each burrito in half and top with soured cream and chopped coriander. Serve with a side of crispy bacon. • For a veggie breakfast serve with grilled Portobello mushrooms or halved beefsteak tomatoes instead of the bacon. • For a really spicy egg filling, fry 1 finely chopped red chilli in the melted butter for a few seconds before adding the egg.